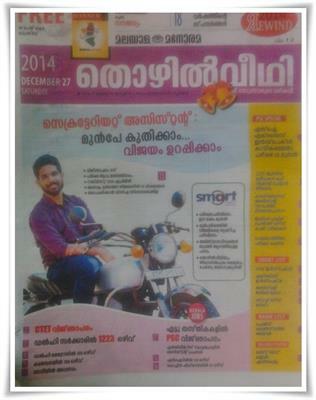 Thozilveedhi is one of the topmost employment newspaper which is being widely read by job seekers in Kerala. The 27th December 2014 issue of Thozhilveedhi is thickly packed with new job prospects in both government and private sectors. The new edition of Thozhilveedhi is comes with jobs in various sectors including job prospects in Delhi Government, Delhi Metro, Army, Navy, NIT, Cochin Shipyard, Milma, Oushadi and Prasar Bharathi. Fresh opening in various universities inside and outside Kerala along with engineering colleges are also reported. Detailed news reports and preparation for the forthcoming Secretariat Assistant exam 2015, CTET Notification, and latest PSC notifications are also given with prominence. While going through the pages, readers can find latest job opening like 1223 vacancies in Delhi Government, 189 in Delhi Metro, 189 in Army, Navy, 128 in NIT, 54 in Cochin Shipyard, 24 in Milma, 21 in Oushadi and 15 Broadcasting Executives in Prasar Bharathi are reported in the recent edition of Thozhilveedhi. Qualified candidates can apply for Assistant Professors in Engineering Colleges. In the PSC special, news regarding the Sub Inspector Physical test to be conducted on 29th December, news on reporting LDC vacancies in June, Junior Public Health Nurse, Cook exams and 1192 jobs in Company/ Board Assistant can be read in the latest issue. The PSC Exam calendar for February 2015 has also been published. Short Lists of Sub Inspector, Excise Inspector, Assistant Jailer Grade I, Staff Nurse Grade 2 and Rank List of Police Constable Driver are given for reference. Solved Papers of Last Grade Kannur and Ernakulam can also be utilized properly. LGS rank file prepared by Lakhsya Academy, IBPS PO exam orientation by TIME, LP/HSA,DEd & Pre Primary Nursery Teacher exam direction provided by Florence Academy,exam coaching titled LGS Rank File, model question paper, LP/UP,HSA, DEd & Pre Primary/Nursery Teacher are also published in this issue. Regular columns including Open Forum, PSC for Beginners, Syllabus of various upcoming Kerala PSC exams and Hall Ticket details are much helpful for the PSC aspirants. Questions asked by the readers are answered by PSC officers. The free booklet 'Competitive Winner' in capsule format is much informative.